Vintage non-crown guard Submariner, model 5508 dating to 1958. 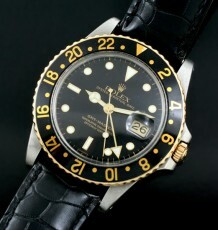 Known as the James Bond Submariner due to the lack of crown guards on the side of the case. A genuine vintage Rolex Submariner reference 5508, dating to the first quarter of 1958. The watch is fitted with the original glossy gilt dial with rare exclamation mark under the 6 o’clock marker. The dial also features the highly sought after silver depth rating in addition to the gold text “Submariner”. 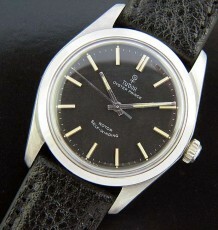 The dial is very pleasing and has a high contrast rate with a deep black background. 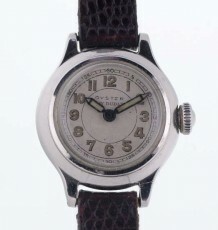 It does have some crazing in the clear lacquer that was applied at the factory when the dial was made. The effect is more noticeable when held at certain angles. This is all part of the aging process of the dial depending on where worn. The case is very thick showing very little signs of ever being polished and has absolutely no pitting on it anywhere. 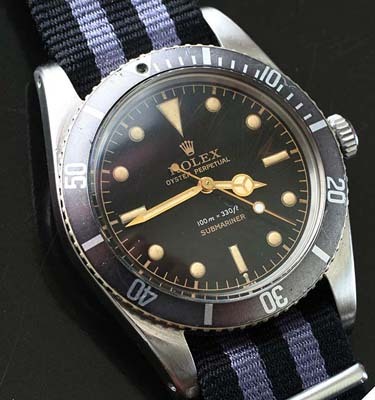 The only issue to report is another common occurrence with models from this era, the serial number is faded do to natural wear on the case and with the bracelet. The bottom half of the serial number is visible with a loupe but not distinguishable. The bezel insert is original to the watch and is a vintage model that must have been replaced at a service decades earlier. It has a wonderful patina and nice fat font text. 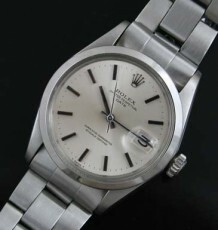 The Rolex automatic calibre 1530 movement was recently serviced and is keeping great time. The case back has a faint serial number of some sort engraved on the back which I have left on as part of the watch’s provenance.